This page has a variety of useful downloadable PDFs including the engine Product Brochure, Mechanical Diagram, and Operators Maintenance Manual. And this engine features Kubota's latest E-TVCS technology. See below for more information on these advanced technologies. 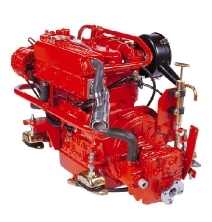 Includes specifications, performance charts, engine photos, options, panel photos, and metric mechanical diagrams for engine models BV1903, BV2203, BF2803, and BV3300. Both US and Metric dimensions for engine models BV1903 and BV2203. Check which transmission and alternator configuration you are specifying. Other diagrams available on request. For engine models BV1903, BV2203. You will need Adobe Acrobat Reader or equivalent to view the PDFs. Click here to download the Reader if you don't already have it. 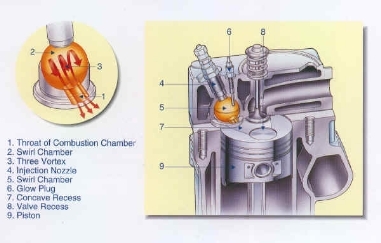 Kubota's proprietary TVCS (Three Vortex Combustion System) obtains an optimum air/fuel mixture by generating three intense swirling air flows (vortexes) within the spherical-combustion (swirl) chamber. TVCS has been a major feature of all Kubota Diesel Engines. Kubota then introduced an upgraded TVCS that added a special concave recess on the piston head to force compression air in the swirl chamber and to smooth combustion gas exhaust. Now, the E-TVCS, based on the latest TVCS, is aimed at a drastic emission reduction. E-TVCS produces far less soot, HC and CO thanks to a better match between the injection nozzle throat and the concave recess on the piston head. E-TVCS meets all applicable emissions regulations world wide. The injection pump and nozzle are better matched with the combustion chamber to reduce NOx emissions. MoS2 Coated Piston - Sulfureted molybdenum coating enables clearance reduction between the piston and the cylinder liner, thus optimizing the oval shape ratio and decreasing the piston slapping noise. Quick Start ups - Super glow system comes as standard equipment to shorten preheating time and quicken engine start up in cold temperatures. Highly Reliable Engine - Based on Kubota's original sturdy design, the engine promises great reliability and long service life.